The MBA is designed to give participants the ability to balance business fundamentals with an entrepreneurial mindset and to be capable of overcoming the problems of uncertain, changing economic environments. Its core philosophy is Entrepreneurial Thought and Action (ETA), a teaching methodology trademarked by Babson. ETA helps participants overcome ambiguity and create economic and social value wherever they go. Our faculty goes through rigorous training at Babson College. This exclusive training program allows faculty to adapt our curriculum and teaching style to the reality of the Kingdom and the region. In turn, this helps participants develop an ambidextrous thought process, learning to balance action and experimentation with rigorous analysis and a deep understanding of business fundamentals and to distinguish when a thought mode is more satisfactory than the other. 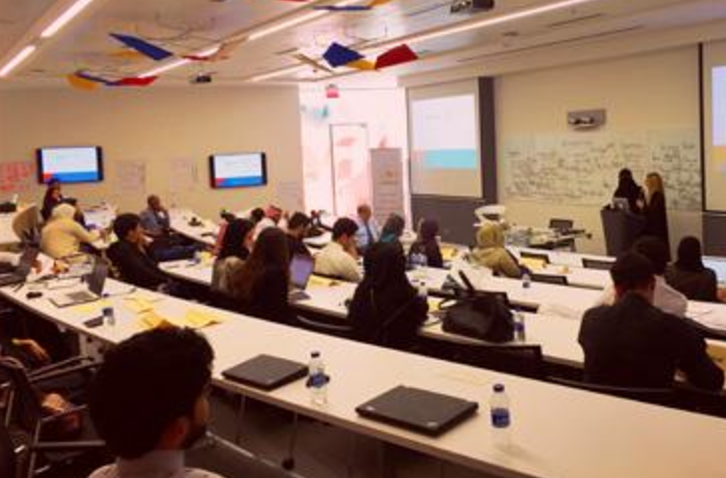 Based on Babson’s unique method of Entrepreneurship Thought and Action (ETA), the MBSC MBA incorporates Signature Learning Experiences (SLEs) into the curriculum to develop entrepreneurial leaders. The SLE is an invitation to develop one’s personal project and tests its feasibility in one of four domains: stand-alone entrepreneurship, social entrepreneurship, family business development, and corporate venturing. Each student chooses the domain of his/her preference and develops a realistic, feasible business that they are expected to launch, manage and grow. Two formats have been designed to accommodate our student’s needs and preferences, including their family obligation. No matter which of MBSC’s two programs works best with your schedule and experience, you can be sure you’re getting the same core curriculum from the same faculty that makes the MBSC MBA program a unique educational experience. Classes for the Full-Time MBA program start in September and you will complete your degree 15 months later in December. Students typically meet 4 days a week from Monday to Thursday. A typical day for Full-Time MBA students will include attending classes, meeting with groups to work on projects, participating in clubs and organizations you are part of, and connecting with other MBA students through elective courses and immersion projects.